Meet Kiah, a crime-fighting police pup in New York City. She is muscular, fit, and extremely athletic like most police dogs, however, Kiah is doing something that has never been done before. She is breaking stereotypes by becoming one of the first ever pit bulls to join the police force. Kiah was found in a grocery store parking lot with a major wound on her head. After being found, she was transferred to an animal shelter in Texas after her former owner was arrested for animal cruelty. Thanks to two animal welfare organizations and a police dog training company, Kiah was able to get a second chance at life. The pup was generously given to the Poughkeepsie, New York Police Department for free, thanks to a partnership between Animal Farm Foundation (AFF), a non-profit organization that is determined to create equal treatment and opportunities for pit bulls, and the Dutchess County SPCA (DCSPCA), an independent non-profit organization that aims to rescue animals, secure permanent homes for adoptable animals, and shelter animals. The typical cost of purchasing a K9 breed, training the dog, and then training the handler can often cost as much as $15,000-$20,000 per dog, so the donation helped the police department immensely. The current two most prominent breeds of K9 police dogs are the Belgian Malinois and the German Shepherd. Pit bulls are almost never used as police dogs due to their stereotypes and bad reputation for violence. Kiah is breaking down these barriers and ending the false accusations against the breed. Dogs are individuals and have their own special quirks, just like people do. Kiah is described as a ‘sweetheart’ and a dog that will excel in her new place on the police force. Brad Croft, director of operations for Universal K9, has trained hundreds of dogs like Kiah for police work. There are many police dog qualities that a potential candidate must have, the first being confidence. The dogs cannot be afraid and must be highly confident in all of their abilities. Another important qualification is that the dog needs to be able to focus on a certain toy or object without getting distracted for a long period of time. In November 2015, Kiah was two-and-a-half years old, and began her training at a K9 school that featured different obstacle courses and practice situations for the pit bull to run through. Kiah is now trained for police detection work such as finding drugs, as well as finding missing persons and cadavers. She was paired with Officer Justin Bruzgul, and together they are fighting crime and stereotypes simultaneously. Kiah completed sixteen weeks of training with Officer Bruzgul, and has been a patrol dog ever since. After graduating last November, she will soon train for another six weeks in narcotics detection in April. Pit bulls often make headlines for negative incidents, but now Kiah is changing the game. 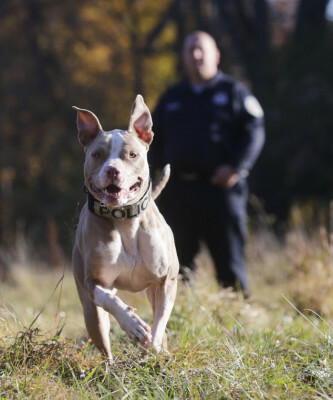 Pit bulls act upon the way they are trained, and officers hope that she can become a trailblazer for the pit bull breed. Kiah was a shelter dog and adoption saved her life. Who knows, maybe she’ll save your life one day too. Have you heard of any other amazing K9 stories? Let us know in the comments below!